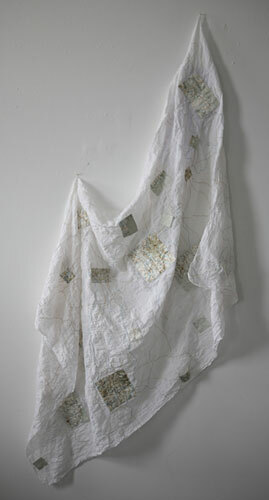 The development of this work relates to a wider exploration of personal geographies, maps and map making. When visiting the exhibition, Quilts, at the V&A in London earlier this year, I was intrigued to read about the use of different papers such as recipes, letters, newspaper, bills, as templates in the making process. These fragments of paper are hidden on the reverse of the quilts and unseen by the viewer, but provide glimpses into the personal history of the quilt maker. 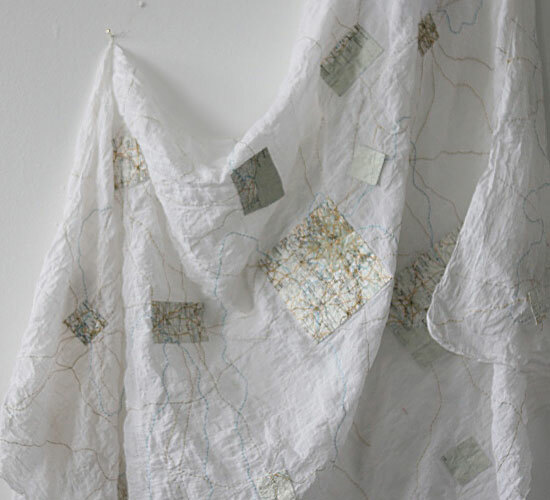 ‘Here’ is intended to explore my personal geography, incorporating old maps of places or journeys of personal significance with stitch and textile techniques.